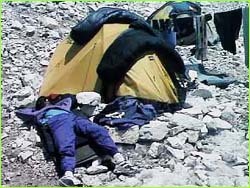 The Japanese Noevir Everest Expedition has canceled their climb on Everest and are packing up to leave Base Camp. Noevir is a cosmetic company from Japan whose executives had set their sights on climbing Mt. Everest this year. Many helicopter loads of employees wearing oxygen masks have been heli-lifted briefly into Base Camp to have their pictures taken with a Noevir company banner. The helicopter landing pad, which was built of stone from the Khumbu Glacier by both the Japanese and Canadian Expeditions, will be used for any future helicopter rescues from Base Camp. According to unconfirmed reports, the climb was canceled because the expedition leader became ill. In addition to the helicopter visits to Base Camp, the Noevir Expedition had chartered daily turbo twin engine Beechcraft flights capable of flying at high altitudes. The purpose of these flights was to gauge weather conditions aloft from three different elevations around Everest. A member of another expedition reported that the Beechcraft registered -47 degree Fahrenheit temperatures at the same elevation as the summit of Everest and that this was also a contributing factor to the cancellation of the Noevir Expedition. To date, members of all other expeditions on Everest's traditional South Col route are proceeding up the mountain, sleeping at the various high camps as part of the critical acclimatization process. David Breashears, Pete Athans and Jangbu Sherpa of the NOVA team left Base Camp on Sunday. Over the next six days they will be making their way toward Camp III, and will then return to Base Camp to prepare for their bid for the summit.